Immediately following the occurrence now referred to as "the Metamorphosis", Thorax is now king of an entirely new race... and he only has a small idea of what to do. This covers the many obstacles King Thorax must now face with his new position- establishing an economy, setting up defenses against the creatures and tribes of the Badlands, and figuring out exactly how his species works now. It's a lot of pressure, honestly. Following another date together, Discord asks Fluttershy to talk dirty to him. Perhaps he should've been clearer about it. An artifact causes an incident where Luna's gender switches, and she becomes prince instead. Evidently, Luna turned out to be a handsome prince. Now having to deal with confused and judging nobility, lots of mares vying for the Prince's affection, the paparazzi eager to get more scoops on the new lunar prince, and a sister who seems to want the prince to stay judging by how she sees the entire situation hilarious, along with her pranks and quips, Luna will have to work hard with Twilight to solve the mystery of Starswirl's Sphere and hope that she can return back to a normal life. Having grown tired of seeing ponies worship the very ground that the Princesses walk on, Discord decides that it's high time ponies started worshiping him instead. In his very own Cult of Chaos, no less. Discord Doesn't Even Want a Cult! Though most view them as simply immortal powerful rulers, some ponies worship the Princesses as actual Goddesses. Some families with deep Earth Pony roots worship the old Nature Spirits of their ancestors. But some ponies turn to darker forces. They worship monsters and demons, praying for plagues and misfortunes upon those they despise. One day, Discord finds out that in his "extended absence", a cult formed with him as the Central Deity. Unfortunately, it's not exactly what he would want. These ponies will soon find out it's a bad idea to anger your god. Edit 5/18/18: New cover art courtesy of the illustrious Mix-up. Check out the original here. Celestia and Chrysalis enter negotiation to end the conflict between their respective nations. And maybe discover something else while they're at it. Twilight has been messaging Dragon Lord Ember for two weeks now, and the other ponies are wondering whom the new Princess’s pen pal is. Twilight gets a brilliant and terrible idea. Cover art by the sensational PixelKitties. 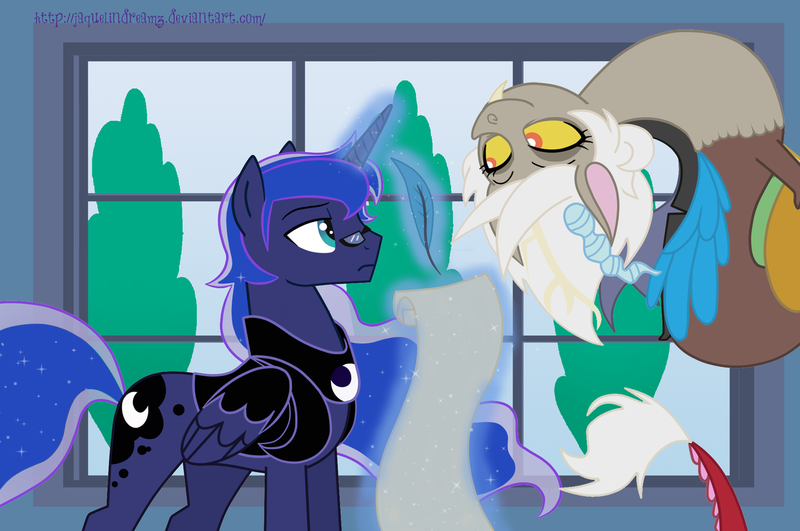 Once a Princess, now a Lord, Ember sends a letter to Princess Twilight to a situation that involves Spike. The letter seems serious and the dragons are already on their way. What could it entail about Ember's journey to Equestria? What does it mean for Spike? Social reject, blank flank, and failed candidate for Celestia's School for Gifted Unicorns, Twilight Sparkle's life couldn't get anymore depressing even if she tried. Yet still she looks to the other things in her life to get by, such as her job selling donuts at Joe's Bakery, her best friend Smarty Pants, as well as her inspiration to someday be as great as The Great and Powerful Trixie herself! Life isn't as bad as it may seem, and she enjoys the simplicity of her daily routine, the peace of her recluse world. That is until suddenly she is targeted by the current ruling body of Equestria, Nightmare Moon herself!? Perhaps she spoke too soon. Better run Twilight, destiny is calling! Point is, I'm Skyla. Got it memorized? SKY. LA. Now these are the stories of how I earned myself that name. And a few other titles. And look, maybe mom and dad say I'm just going through a phase, but I say PHASES ARE FOR WIMPS. This, is who I am! And the only reason I'm using Circus-Cinnamon's photo is because I can't find any other photos with how I really feel on it. I mean seriously, crystal ponies, I'm yelling half the time, is it that hard to take an angry picture? !